A little background: Smitten Kitchen is approaching its 13th anniversary on the internet, and I’m hoping for all of our sakes that its 13th year is nothing like mine (some very bad bangs decisions and a whole lotta awkwardness). When I began this site, I knew how to cook very few things. What I did know was what I wanted from the things I was cooking and where the dishes I was auditioning either exceeded my expectations or fell very short. I logged it all here like a dutiful aughts-era blogger with no larger agenda for what it would become, because how could I have known? I never knew I’d still be at it 1200 recipes, two cookbooks, and two children of unparalleled cuteness (no bias here whatsoever) later, although still in a small kitchen because I’d missed the Buy Tech Stocks or Possibly Have Become A Banker memo, but this is not a complaint — not about this lot, not in this lifetime. I’ve learned how to cook hundreds of things over the years, and I’ve learned hundreds of things from the things I’ve cooked. An editorial conundrum I had never considered but that comes up pretty frequently is what I should do with a recipe way back in the archives that I no longer cook the way I once did. I could leave it. I mean, this website is an Important Historical Artifact. It’s essential that every stupid thing I’ve said in 13 years remain preserved intact on the web for all time. For, like, science. Needless to say, I am not devoted to this point of view. I could change the recipes, and at times, I have. In general, I make changes to recipes when they’re not working the way they should, when the original way of making them is unnecessarily complicated, or when a small piece of new information will drastically change it for the better. However, this often leads to confusion. Imagine being in the middle of making a recipe and you reload it and it’s totally different. It’s happened; I’ve gotten the panicked DMs. Plus, just because I wasn’t happy with it doesn’t mean nobody else was. I try to make the changes clear but I blame nobody who doesn’t want to read small type while making a recipe you’ve made for 8 or 12 years now. Sharing a new, better version of an older an old recipe seems the most straightforward (see: even more perfect apple pie, foolproof cacio e pepe, luxe butterscotch pudding, and tall, fluffy buttermilk pancakes, but I don’t do this very often. More often, I’ll make a recipe the newer way I prefer, write it up, take photos, and then… table it, until I figure out what to do with it. (v.5 of a roast chicken saga is not, to me, an engaging premise.) Earlier this year, I realized that my “let’s figure out what to do with this recipe later” list had grown quite large and it was a shame to keep you from what I consider newer, better versions of classic SK recipes. So, this month, let’s try something new. ✨ Newer, Better Month, which begins right now on Smitten Kitchen, is a chance to revisit recipes I’ve been making forever with new knowledge, new techniques, and new real-life time constraints. March seems like the perfect time to do it. It’s such a slog of a month, if you ask me; too wintry, too few holidays, and this year, a bit of bleh in the middle too. I’m eager for a little distraction. And I want to begin with spaghetti and meatballs. One of my earliest cooking influences happened the day I watched an early-2000s Barefoot Contessa episode in which Ina Garten tells us her husband invited friends or colleagues over for dinner and they were probably expecting something fancy but she (surprise) was making spaghetti and meatballs. She knew then what so many more of us know now: entertaining doesn’t need showy, and as most of us aren’t getting treated to impeccable meatballs and spaghetti at home on a regular basis, this would be a welcome treat. In 2008, I made them Ina’s way. They’re, of course, fantastic. But it makes an epic amount, frying meatballs is messy, there’s never enough sauce, and I prefer a simpler one that lets the meatballs shine. Although it didn’t physically pain me to look at it at the time, I know this isn’t everyone’s thing, but rewatching the episode now and seeing sauce poured over undressed pasta (vs. finishing the pasta in the sauce so they harmonize as the gods or at least the nonnas intended) is like fingernails on a chalkboard. The recipe below is the way I make it these days, and (surprise) now that I can make them beginning to end in under an hour, I do it fairly often, much to the delight of kids, friends, and I hope soon you too. There’s actually a lot flexibility in the meatballs. A blend of pork, beef, and veal is traditional. I usually go half-half with the first two, but I’ve also made these entirely with ground turkey (a mix with dark meat it in is much better) and they’re a little softer (you could use a tablespoon less milk) but taste delicious. You can skip the parmesan and replace the milk with water if you want to make it dairy-free. You could use ricotta instead of milk for extra richness. You could add finely chopped prosciutto to the meat mixture, or even use ground sausage meat for half of the meat mixture. You can use 1 tablespoon finely grated onion instead of onion powder, and you could make your own breadcrumbs from any old piece of bread and grinding it up — use 2/3 cup instead of 1/2. 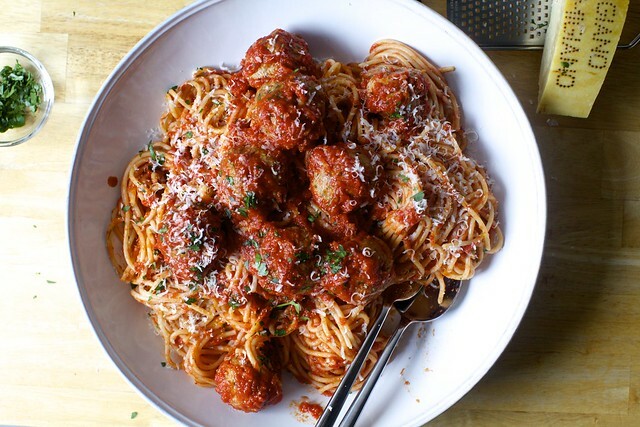 This recipe makes a moderately saucy pot of spaghetti and meatballs. If you like or want extra sauce, add a second full-sized (28-ounce) or half-sized (15-ounce) can of tomatoes and amp up the seasonings accordingly. I really prefer what is usually sold as crushed tomatoes here; it’s a not-totally-smooth puree that clings nicely to the spaghetti and meatballs in a way that chunkier blends do not. If you can only get whole or diced tomatoes, mash or blend them up a bit, and add 1 tablespoon tomato paste so it’s a little less watery. When I have basil around, I usually cook the meatballs with a sprig of it to infuse the sauce, then fish it out before serving. Bring a large pot of very well-salted water to boil and heat your oven to 425 degrees F. Line a large baking sheet with foil for easy cleanup, and coat it lightly with a nonstick spray. Place meat, crumbs, milk, parsley, cheese, 1 teaspoon salt, pepper, onion powder, eggs, and one-third of your minced garlic in a large bowl, and mash everything together with a fork or potato masher until evenly mixed. Using wet hands if needed, form mixture into 2-inch meatballs (I used a 3 tablespoon scoop) and arrange on prepared tray. Roast for 12 minutes, until cooked through (you can cut one in half). Once water is boiling, cook spaghetti until one minute shy of tender. Set aside 1 cup of cooking water before draining pasta. In a deep saute pan or wide saucepan, heat 2 tablespoons olive oil over medium heat. Add remaining two-thirds of garlic and a pinch or two of pepper flakes and let sizzle until garlic is golden, 30 seconds to 1 minute. Add tomatoes (beware the spatter!) and season with remaining 1 teaspoon salt. Let mixture simmer for about 5 minutes, stirring occasionally, although longer will do it no harm if your meatballs aren’t ready yet. When meatballs come out of the oven, add them to the sauce and stir so they are coated. 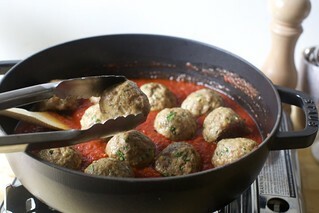 Reduce heat to a low simmer, put a lid on the pot, and simmer meatballs in the sauce for 10 minutes. At this point, should you not be eating them right away, you can remove them from the heat and set them aside. When you’re ready to serve: Return your spaghetti to its empty cooking pot. 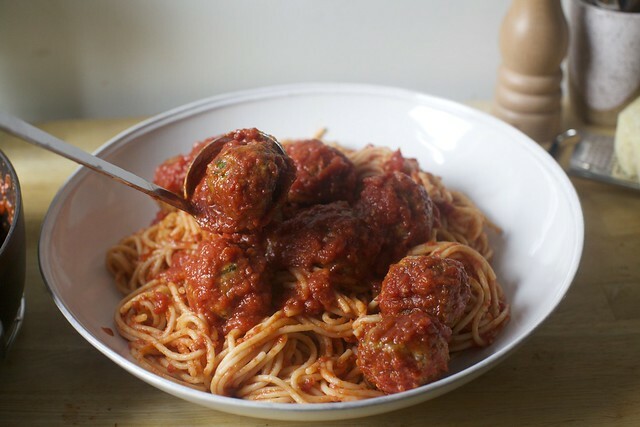 Push meatballs aside and grab a few ladles of their cooking sauce and pour over spaghetti. 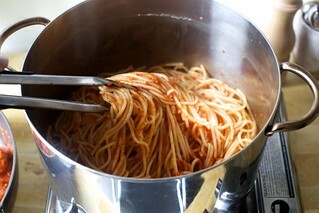 Add half of reserved pasta water and cook spaghetti and sauce over high heat for one minute, tossing the whole time. Use additional pasta water as needed to loosen. 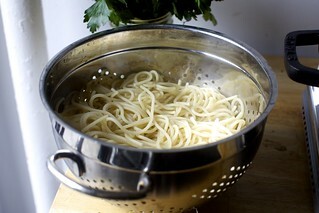 Use tongs to transfer spaghetti into a large, wide serving bowl. (If you give the bowl a little spin as you lower the spaghetti into it, you can make cute little piles.) Add the meatballs and their sauce on top. Garnish with parsley and additional grated cheese. Eat right now; do not wait. HAPPY birthday!!! Does this mean you’re getting bat mitzvahed?! Love this new concept, and love how consistently creative you are! Is it weird that I know exactly which Barefoot Contessa episode you’re talking about? Her boss came to dinner, and Ina made ice cream sodas for dessert! Wait, Ina has a boss? I always thought she WAS the boss! Perfect. All three children and husband could not get enough which is basically a 1000 star review. I recently made a double batch of your everyday meatballs (funnily enough, posted three years ago to the day!) and ended up baking half on the sheet pan. While the balls cooked in sauce were moister, the sheet pan balls had a better exterior flavor from browning. With this updated recipe that (which seems to use a hybrid oven/stove approach), you’ve got me wondering–which is your preferred method? Are there times when you use the everyday meatballs method on spaghetti, or is it solely reserved for non-spaghetti ball applications? Thanks! I would also like to know, as the EVERYDAY MEATBALLS, cooked in sauce are epically good. Sorry for any confusion. (And the delay — busy afternoon!) They’re very much the same flavors! I have since become converted to roasting meatballs. It’s faster; they look better. And because you can then weave in the steps, I get spaghetti and meatballs on the table in 45 minutes, which is just magic to me. So, no need to change your loyalty if you’re happy with the everyday meatballs. But this is the way I put it together with spaghetti these days. I made the new version this weekend. The response? “I like these better”. So I stand corrected and am now converted to the roasting of the meatballs first. Thanks Deb! Exactly what I was wondering – the everyday meatballs are a staple in our home and have wowed guests time and time again. I’ve made a variety of other types of meatballs across the stove and oven and none ever compare. PS I love the idea of revisiting old recipes! We all evolve over the years so why shouldn’t our recipes?! What Francoise said! Yes, please continue revisiting and revising. I LOVE the idea of revisiting old recipes!!! Thank you! Thank you for this! I might actually brave meatballs for the first time because this sounds manageable. My best friend from elementary school told me about smittenkitchen when I was first out of college. I was immediately hooked! Your style of cooking and writing has been profoundly influential in my life. You’ve made cooking new and unfamiliar things so much more accessible. Under your tutelage, I have made countless challahs, korean ribs, butter pickles- things I may have never tried to make. And on top of that, you put forth such an open minded joy. Thank you for everything! We love spaghetti and meatballs! Will be trying this soon. Has anyone made it without the eggs? We have a recently diagnosed egg allergy to cook around … do the meatballs stay together ok without it? My friend forgoes the egg and subs in more milk OR buttermilk to give it some richness and also tenderize everything. If you’re afraid of them falling apart, you can shape them into balls and refrigerate for 20-30 minutes. No, it will absolutely work all-beef. I just made them tonight with 85/15 ground chuck. Worked great! The whole family enjoyed! Sorry about the egg allergy! I have been working with Aquafaba lately for similar reasons. If you haven’t ever heard of it, it is a total game changer! Basically, it is the liquid poured out of a can of chickpeas, and it’s magic. I have been making meatballs for years without egg, due to an egg allergies kids (now young adults). I just add a few more breadcrumbs, milk and sometimes parmesan cheese. Using some sausage in place of ground beef helps hold the meatballs together, too. Anyway, they taste great! I have been making meatballs without eggs for years because my husband can’t eat eggs. The egg stretches the meat so I leave out the milk (son can’t have dairy) crumbs and egg and mix them up a bit more with my hands. As they get mixed they cling together better. What changed my meatballs for the better was to mix together the breadcrumbs, garlic, parsley, Parmesan, eggs, olive oil, a bit of chicken stock, and milk and then let them sit for 10-20 minutes. Then I gently incorporate into the meat and bake, broiling at the end to give them some color. I’ve never made a more tender meatball. These look divine! I’m really glad you’re doing this, thank you! Sometimes I hesitate about making a very old recipe in the archives (especially cakes I’m making to feed friends) because I wonder if you would still rate them compared to more recent amazing cakes. I never considered making black bottom cupcakes (I think subconsciously I assumed they were burnt?!) until I saw the new photos and now cannot WAIT for an excuse to bake them, they look so good. Ha! Thanks. First, I promise that nothing in the archives is garbage or unmakeable. I just wouldn’t leave it without a very clear warning. A good way to check if you’re nervous is scroll to the end of the comments for the most recent ones; they’re always from people who have made it. Mostly when I remake very early recipes these days, I can see that I was too tentative to change an original recipe, treating it like canon. Years later, I’m a much more confident cook and I know what I consider worth my and our time. So, when recipe changes are made, it’s usually just making it easier and more realistic for weekday nights where possible, which wasn’t in the least my concern 12 years ago. Great idea to revisit some old favourites; excited to see what else is on the menu! Interesting! I love your everyday meatballs that are poached in the tomato sauce, but perhaps I will be convinced to try this new way. Yes agree !! I’m a huge fan of your every day meatballs (love them with your garlic bread). What’s the change here and why the need?? You should try making them with ground bison/buffalo instead of regular ground beef. Lower fat profile on bison, which allows you to use a ground sausage instead of just ground pork with the veal. I have two favorite things about your site. #1 I know you’ve tried every recipe and #2 that you post updated recipes (see Cacio e Pepe and Zucchini Bread). Thank you for posting these updates! It’s so rare for recipes to be revisited, and I love that you do just that. 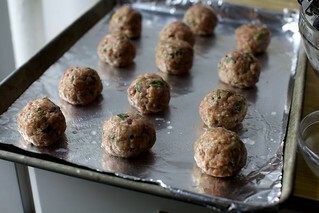 Is there any difference between baking the meatballs on foil v parchment paper? Some parchment paper isn’t okay over 400, but most is fine. It will say on the box. Also, I generally ignore it anyway, but didn’t want to lead anyone astray. I make my meatballs and pasta (I don’t always make spaghetti) pretty much this way. I rarely use more than one kind of meat in my meatballs and I air fry them, if it’s during the week and want a quick dinner, or cook them in the sauce if I’m making it on the weekend and have the time to let them cook. They don’t take very long to cook in the sauce and I love the taste of the meatballs and how the meat flavors the sauce. It’s always good to revisit and tweak things. We evolve over time; so should our cooking. Thinking of you today will continue to think of you as the incredibly sad anniversary comes closer. Your tribute when I first read it made me cry and still makes me tear up just to see it. Sending you love. Would you recommend freezing them after baking and cooking them in the sauce to thaw them out? Or do you think it works better to freeze the raw meatballs and up the cooking time by ten minutes or so? Thanks! Let me know if you figure this out, I’m wondering the same thing! I think I’m going to try cooking first and then freezing and re-warming in the sauce since that makes even less work on a busy evening. Yes I would also like to know this please Deb – I’d like to double the meatballs and sauce part of the recipe and freeze half for another day. Love the idea of revisiting recipes, and also seeing what some of your favourites are. I’ve just set myself the goal of learning to make some new classic-everyday style dishes so this is perfect timing. I have been making meatballs this way forever. I always make extra and freeze some. Cook and then freeze. You can thaw them in the sauce or the frig. I always make big batches of meatballs like this and freeze. Sometimes I just put them right in the sauce frozen but mostly I partially defrost in the microwave and drop them in. I can turn out dinner in 20 min this way. I think either work. I would probably, personally, bake them, put them in the sauce and save that 10-minute (or longer) simmer for after they defrost, to finish it. Because you’re going to re-warm and re-simmer them anyway; why do it twice. May I suggest that you move the spaghetti-cooking paragraph later in the recipe? It makes more sense to me to do it after you’ve started the sauce, or even after the meatballs are out of the oven, so that the spaghetti is still reasonably warm when you finish the dish. Also, this sounds easy and delicious; thank you for the new version! I had the same feeling. 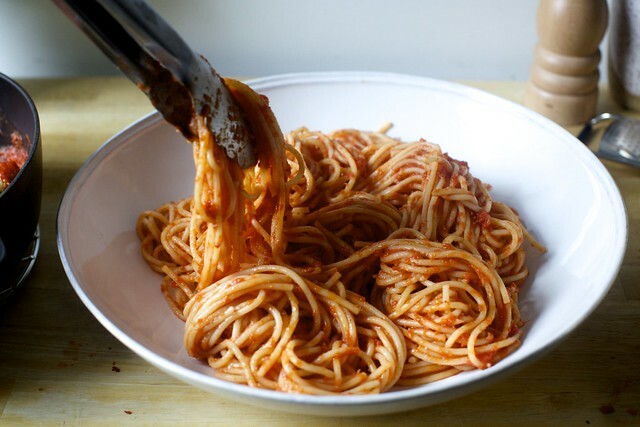 Sauce can get better if it cooks longer, but pasta can get worse, and I usually assume a recipe writer puts steps in a certain order because you are better off doing those steps in that order for a reason, but this could lead to overcooked pasta if you’re not on top of it. So, you can absolutely do it later but I intentionally wove it in when I did because I like to get it out of the way as soon at the water is boiling. Since you’re finishing it in the sauce, thus reheating it, it’s not necessary to wait until the end to make it. It will not overcook because you undercooked the pasta. It sounds so basic but I wanted to lay this recipe out here and like this (versus just piggybacking it on my previous meatball recipe) because when I was a beginner cook, I always struggled with the order of things, how to use my time best. So the meatballs would be done and the pot of pasta water would then take 10 to 15 minutes just to boil (my stove is not the best) and then another 10 minutes to cook the pasta and suddenly the spaghetti alone added 30 minutes to a “quick” recipe. Hope that explains that rationale better. I did it in the order recommended and it worked perfectly, even though I was skeptical. And I got dinner on the table really fast. Definitely 45 minutes or less. I love that you’re doing this. FWIW I like when I read a recipe here and I see you’ve updated it. I hope you keep doing that. Can’t wait to see what else you spruce up. I admit, I have high hopes for a bolognese revisit. I learned how to make bolognese with your recipe many, many times, but have since tried Marcella’s (white wine instead of red, whole canned tomatoes rather than paste, and the addition of milk), and now I like to combine my favorite parts of the two. Tomato paste, lots of milk, aaaand whatever wine I have on hand. Most recently, I’ve tried Kenji’s, and found all the extra umami ingredients very high maintenance but very delicious. Would love to see how your recipe has evolved! I was thinking about Bolognese, too! I use a wine-y one that doesn’t work as well these days with kids. I have a few tiny quibbles that don’t seem to be shared with others about Marcella’s, but understand why many consider it the gold standard. As always, open to suggestions for revisits! If not this month, then another. When/if you revisit it, please share your quibbles! I’ve made your lasagna bolognese two ways, one with yours recipe and one with hers, so I’m curious about your thoughts on the differences. Actually, is this a safe space? If so, and honestly, this is just my own personal thing, but I think that because she calls for 1.5 cups of chopped tomatoes, people usually use canned diced tomatoes, an ingredient I deeply do not care for. They’re often chemically treated so that their shape remains intact while they’re cooked, meaning that no matter how many hours you cook the sauce, you have cubes of tomato throughout that look like they just left the can. I also prefer a more minced soffritto/battuto than she explicitly lays out; I’m not into visible chunks of carrots or celery in my final sauce. And I work with different proportions, basically the sizes we buy products in. Again, these are small nitpicks but in a recipe with all of 8 ingredients, the changes add up. Obviously, it’s time to write this up! Thanks for sharing! In reading your thoughts, I realized I feel the same way. When I make Hazan’s bologenese, I typically use whole canned tomatoes (which I puree) and I process the carrots/onions/celery very fine as I also don’t like large chunks. Thanks for this update. I often find myself looking on your website first when I’m about to make a classic dinner recipe I haven’t done in a while—just to see what your hints and updates might be—thank you! Thank you. Is it Epicurious? Betty Crocker? I’m curious! I have been making my meatballs this way for nearly 20 years. I would see a new meatball recipe but think “nope”, my way is quick and easy. Now I am going to try getting fancy and dress the pasta. These look delicious. Also congratulations on the anniversary! 13! WOW! Deb! What about the Everyday Meatballs from 2016? We LOVE those and I have made them 4 times the past couple months, twice for families with new babies, and received rave reviews. It’s SO good! How do you compare that recipe with this one? Or do you use these two recipes for different purposes? Making this tonight! Looks wonderful! I make many of your “old” recipes. This week I made the spinach quiche and earlier the sautéed matchstick zucchini. In fact, I just had some cherry yogurt and a slice of the quiche for breakfast…and of course, tea! As always, it is a total pleasure to read your site and recipes. Am I the first to notice this minor blip in the text? When meatballs come out of the oven, add the to the sauce and stir to coat them. Deb…I love your recipes and print dozens of them, but I also love the lead-in and your pictures. How can I print all of it ? I hope there’s a solution to this. What a coincidence. I made these for dinner last night (Friday) before I saw this post :). With ref. to printing all parts of the recipe including photos, I copy and paste onto a word doc using the “Keep source formatting” option – this gives all the text + photos and then print or more often, save the doc in my ever growing smitten kitchen folder. I have tried this one is home and they looked delicious, but i have added soya milk in the recipe and taste was yummy. kind of Indian soya bonda, thanks for the recipe. Thanks for continuing to be so honest and practical. 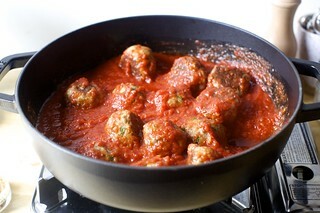 In that vein, I have always just made the sauce and put the raw meatballs into simmering sauce. I always add dry basil to the sauce, fresh parsley to the meat. Cheese in/on both. It works, and doesn’t take any longer. Sure, made a day ahead, the flavors have time to meld more, but this way, I have one less pan to wash. This has me practically drooling! Do you know about how many meatballs it will make? I don’t have a 3 Tbsp scoop, and I’m bad at eyeballing size, so it’s help me to have a number to aim for. Thanks! I doubled the recipe and got 30! I’m pretty sure I was using a 3 (or maybe 2.5) tbls scoop. Yes. I get 22 to 24 small (about 1.5″) meatballs with a 1.5T scoop, or 13 larger (about 2″) with a 3T scoop. As someone who has been making your version of Ina’s spaghetti and meatballs for years, I’m very excited to try this new version. 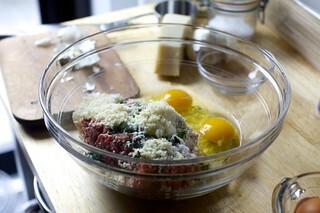 And I love the idea of incorporating prosciutto slivers into the meatballs. Our tastes change over time, so it seems totally fair to want to share updated recipes! Having made the “old” version of spaghetti and meatballs, I thought I give the newer, better version a whirl for dinner tonight. Perfect spaghetti and meatballs replaced the previous version as soon as it crossed our lips. Absolutely delicious!!! So glad that I doubled the meat mixture and put half in the freezer for later! When the time comes to thaw and cook the mix, I’ll double the sauce, which is uber easy to make. Thank you!! Love this! I need to remember to bake the meatballs next time I make this! Thanks so much Deb!!! I made them gluten-free by using gf panko and gf pasta. Everything worked great and the meatballs had such a deep flavor! I loved the extra flavor boost from the pesto, so I’ll continue to do that whenever I have it on hand. I love this recipe update! Yum. I made this recipe about 4 nights ago (the old way) and I substituted almond meal for the breadcrumbs to make it grain free (I can’t believe who I’ve become…) and they were absolutely magnificent, the almond made them super tender and succulent. I will never bake/fry my meatballs again! Anyway I thought gluten avoiders might like to know this trick. But the recipe calls for baking the meatballs—I don’t understand your statement you will never “bake/fry” meatballs again. How did you fix them per this recipe? Emmie, I read that Hobblesthebear “fixed” the meatballs by replacing breadcrumbs with almond meal. It’s more of a “trick” than a “fix” —- no claim that the recipe was broken. On the contrary, Hobblesthebear seems to be a fan of this recipe. Their claim that they will “never bake/fry again” shows that they have learned a new favorite technique from this recipe: just baking, without also frying. Never having been a fan of spaghetti and meatballs ( I know…right?) I have not thought many recipes interesting enough to try. The first photo had me drooling, the “dry meatballs” on the baking sheet was the clincher. Now I am not only going to try these, but am willing to risk having a go at your other recipe that has so many fans, as well. This site has always been a “game changer” for me, thanks Deb. Apple Sharlotka, Egg Salad with Pickled Celery, and Double Chocolate Banana Bread have been in the “rotation ” since Day One.Never make them any other way but yours! Super excited for this new feature!! As the mom of a 3.5-year-old and a 1.5-year-old, I rarely have time to cook anything that takes more than an hour. But I still enjoy cooking and don’t want to have to rely on something that comes out of a box in the freezer (hello, chicken nuggets and fish fingers) more than once or twice a week. Looking forward to starting with the spaghetti and meatballs (always a win with my fam). Thank you, Deb!! We made this recipe with minced chicken, and there were way too many eggs in this recipe. I’ve looked at a Ina Garten recipe, and it had half the eggs. Is that perhaps a typo? No; it is correct/what I use. The chicken mixture is going to be very soft (as I noted up top) but it does work. I am a huge fan of roasting meatballs- much neater! But now this way it looks like I can get perfectly spherical meatballs and not have to babysit them in the pan. Loving the idea of doing the updates to old recipes! It’s a really interesting way of seeing how our skills as cooks grow as our lives and priorities shift. So delightful and so easy! Without a doubt the best consistency of meatballs we’ve ever made. I thought they were going to be too wet with the two eggs and the milk but once they were baked they were absolutely PERFECT! Sauce was really great too, but I might amp that up a bit next time if I have a little extra time. The basil you suggested was a great idea. Added flavor and aroma immediately. You’re fabulous! I made these last night for a dinner party and they were absolutely perfectly amazing. I was struggling with what to make for adults and a few kids and this was just the right things. Other than doubling the recipe, I followed it exactly and wouldn’t change a thing. THANK YOU! I had been “on the market” for a new meatballs and spaghetti recipe and was so glad to see your new post! Saw the recipe on Sat night and they were in the pot for Sunday night supper. Quick, easy, tender…happy mom, happy kids…. I have just found your site…and I’m so glad that I did. Love this recipe; your writing is fun and fluid and makes me feel like I’m standing in your kitchen with a glass of wine in my hand. Thanks for sharing :) Looking forward to following your blog. I decided to make my recipe [ based on the loving memory of my mom’s cooking ] of meatballs and spaghetti. For those of you who do not eat pork or sausage [me], I only use organic meat and veal [one pound each], blend with the usual egg and – yes- whole wheat bread crumbs – and seasonings. I have never liked the idea of frying the meatballs first so I open up my can of Tuttorosso Crushed Tomatoes in Puree, add my basil,oregano,crushed red pepper flakes, minced fresh garlic, etc. and then, when the sauce has warmed and seasonings blended, I drop my 3 tbsp size meatballs directly into the sauce. They are moist and done within 15 minutes! Truly, comfort food in the winter. Spring is not far behind! Do you cook spaghetti and let it sit drained. Do you toss it in olive oil or does it separate easy,when you put the sauce and pasta water with it. Just want to make sure. Thanks. It just sits drained. It’s not that long so and will unstick if stuck when you add the pasta water and sauce. I haven’t made these meatballs yet but I got meatball advice from an old Italian Nonna so I’m passing it on. Always mix the spices, eggs, breadcrumbs etc together well, then add the meat. If you touch the meat a lot, the meatballs will be tough, kind of like pastry – the less you touch it, the better. Just made these last night and they are fantastic. Perfect texture, nice meaty flavor that’s not overpowered by extras, and I can’t wait to eat the leftovers! I actually made a double batch since my ground beef and pork came in 1-lb packages… One note, mine took more like 18 minutes to cook through, and I had better luck getting them off the foil after they’d cooled down for a few minutes. Tomato sauce spatters. It would splatter if you dropped the whole thing on the floor. I have learned something new today! Good! Are you going to correct it in the recipe? Deb, have you ever cooked the meatballs in the tomato sauce after theyve been browned? I find that it gives the tomato sauce a wonderful meaty flavor in the background. Yes, I used to! I liked it but I like the time and mess I save now more. as a German, I’ve always wondered about this meatball thing you Americans do with spaghetti. I find it very impractical to eat when you could also just put your ground meat in the sauce to make a Bolognese that you can slurp up with the pasta. Plus, none of that meatball-forming-and-then-baking-or-frying work. But alas, it must be a culture thing :) I must say, these look delicious. I found that tomato sauce gets even more perfect with one teaspoon honey or sugar added! Lara, I am Italian and if you believe it or not, in Italy meatballs are NEVER EVER served with spaghetti or any kind of pasta. We usually use the sauce on pasta but the meatballs are served separately as second dish with vegetables on the side or salad. Sugar is never used either in the sauce unless it is made with fresh tomatoes that are a bit sour so a pinch of sugar makes it sweeter, but never with store bought tomato sauce or diced tomatoes. Don’t know why in USA spaghetti & meatballs is claimed to be typically italian because it definitely is not in Italy. A side note for the other ladies asking how they can substitute eggs….bread soaked in milk (or water for dairy free version) or a cooked mashed potato is a wonderful binding agent that keeps them soft as well. 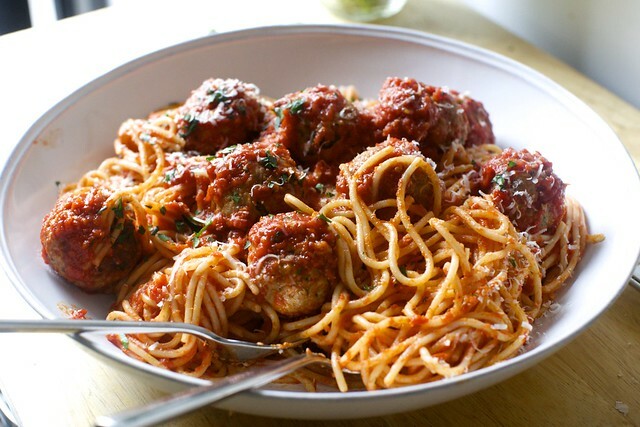 I have been making your everyday meatballs (without the crumbs and cheese) and adding spaghetti for a long time; never thought baking the meatballs would make such a huge difference, but omg, it really makes them perfect! Even with an all-beef meatball, they were so soft and amazing! Thanks! Thank you for this site. I follow it all the time. I made this last night and it was super easy and quick! It was only the second time I’ve made meatballs because I’ve always found the frying such a hassle. These meatballs were incredibly flavourful and tender. I did not alter the recipe but did use 50/50 pork/beef. Great hit with my husband! Made this last night with ground turkey. I ended up using way less milk than called for (only about 2 tablespoons). And I chilled the meat mixture for about 20 minutes before making the meatballs, just to make it a bit easier to handle. The meatballs were beloved by all in my family (including one very picky eater) and the sauce was delicious! Thanks for another amazing recipe!!! I made this last night, and my generally-non-pasta-eating, non-red-sauce liking husband stopped mid-way through his meal* and said, “Hey, this is really good!” Putting this into the rotation for sure. So easy to make, so delicious (even with a bunch of substitutions). Since I keep kosher and don’t eat garlic, I didn’t use the cheese or milk, chopped up some fresh fennel for extra flavor, and used ground turkey. This will be a weeknight staple from now on! Really yummy! One of my first smitten kitchen recipes and excited to try more! Perfect! A super quick and tasty iteration of the beloved classic. Followed to a tee- adding only a Parmesan Reggiano rind and a splash of pasta cooking water to the sauce. Yes. Usually it’s just very smooth but that’s okay if it’s fine with you. Oh, and I find it can get too thick faster so loosen it with more pasta water if needed. I made this for a Friday night dinner and found it delightfully easy and delicious. Would absolutely make it again. I don’t think there’s an Italian on earth who puts onion in their meatballs. Sorry Deb!! I made a double batch of these last weekend. I used half pork and half beef. They were such a hit that I made them again this weekend! Easy and so, so good! My 6 year old ate at least 8 of them each time and today will probably have them in a sub. I have made so many of your recipes and every one has been on point. Thank you for being one of my favorite recipe resources for 6+ years! Hi Deb, solid fan here! I’ve made your everyday meatballs (which are almost identical to my regular favorite recipe) – with one change. When I tried using the breadcrumbs, it had a breadcrumby flavor I didn’t love, so I went back to using my regular grated zucchini instead. It adds the same softness and you can argue that it has some minor health pluses as well (though who are you kidding, it’s just half a cup of breadcrumbs – I don’t deserve any awards here!) Have you ever tried subbing grated zucchini? I made this a few days ago, and the meatballs in particular are so good – so flavorful! I didn’t think I liked meatballs very much (they’re fine, but not my favorite thing), but this recipe might have converted me. Small changes I made from the original: Used turkey in place of the suggested meat blend, skipped the eggs (because we ran out), grated some onion instead of the onion powder, and used the full amount of milk (because I didn’t have eggs). Thanks Deb I loved this recipe for meatballs and the oven makes it so easy. I made a triple batch (sans pasta) and put it in the freezer for when bub no.2 is due. May as well if I’m going to the trouble of turning the oven on and making meatballs by hand! Although, if I wear a rubber glove I can do them one handed while fending my toddler daughter away from the bowl of raw meat with the other hand and it didn’t take that long because I’m not fussy on making tiny ones – ping pong ball sized is fine. I used half beef and half pork mince, and replaced the crumbs with 2 stale slices of bread soaked in the milk. I also added some fennel seeds I had handy. Yummo thanks a million. Made these last night and served with chopped broccoli tossed with grapeseed oil, salt and garlic powder and roasted for 25 minutes until lightly crispy while the meatballs were roasting. Toddler rejected the broccoli but deigned to eat the lightly sauced spaghetti (usually only plain noodles are acceptable) and refused the meatballs. Made with whole grain spaghetti, all ground beef (what’s in the freezer), doubled the garlic (we like our italian super garlicky, weird, I know). Realized I forgot to add the milk to the meatballs when I heard the clink of glass on the counter and saw toddler drinking the milk out of the measuring cup as I was rolling the meatballs (they were a little firm but still quite tasty – will try not to be so distracted next time). So, all in all, a delicious but still typical Sunday evening. And delicious lunch leftovers today. Made these just as described. No tofu or almond “milk.” Absolutely the best! For St Patty’s Day, subbed out the boxed pasta for homemade spinach tagliatelle. Divine. Thank you! My family enjoyed this and it will be repeated with a few tweaks. Like a few others have commented, the meatball mixture was too wet and did not hold together well. My meatballs ended up being flat on the bottom and stuck to the pan. Perhaps letting the mixture set up a bit so that the panko can absorb more moisture or using only one egg next time might solve this issue. Otherwise, the flavor was delicious and the sauce was easy. Thanks for updating an old favorite. I used only one egg, and it stayed together perfectly. Greetings from Canada! I have followed you for years, and my family has enjoyed many wonderful meals thanks to your talent. I’m writing to address a previous question regarding binding meatballs. We have an amazing product now in Canada called Eggcitables created by a young woman to address one of her many allergies.You can actually use this product as you would a real egg. Her website is http://www.eggcitables.com. Hope this is of some help to your readers. Small anecdotal data point re sauce incorporated vs sauce on top: my particular nonna always just added a small amount like a quarter to half cup to the “white” cooked spaghetti, piled it on a platter, poured just enough sauce on top to make it look pretty, surrounded the spaghetti with meatballs, and always put a gravy boat with warm sauce on the table for everyone to help themselves to exactly how much they liked. Best of both worlds. I don’t care for the taste of pasta finished with sauce in the pan, trendy though it is; I enjoy the taste of the actual pasta, the separate taste of the sauce, and the two combined. Delicious!! With a couple substitutes: I used pre seasoned Italian breadcrumbs and didn’t adjust my other seasonings, and it was fine (not over seasoned). I also used a jar sauce (fancy-ish brand from Whole Foods). I made the prior version of these and thought it was so much work. This recipe is sooooo easy/fast and perfect!! I upped the garlic by a couple cloves total and started the sauce with 1/2 an onion (Indian tastebuds lol) and it was perfect for us! It’s super fast and easy to make, truly a wonderful weekday recipe, thanks! This truly is, for me, a perfect meatball recipe! Perfectly flavorful, moist, amazing texture. Next time I will definitely double the sauce, but other than that it was a home run! And also just as fast and easy as promised- I did the recipe plus bread and salad in around an hour and a half, which is fast for me :) Thanks! This dish is delicious. Made the meatballs with beef and veal because that’s what I had on hand. Thank you for another lovely recipe. Made this on Sunday, but also made our own pasta, which was a fun adventure. This was delicious!! I used ground chicken since we don’t eat red meat, and the meatballs were still super moist and tasty, and it came together so quickly. Thanks for another amazing and delicious recipe! The meatballs were fantastic! I definitely wish I had made more sauce—it wasn’t enough for us. Made exactly as is, loved the results with adding sauce to the pasta first. This will go on repeat! I already have a favorite sauce & meatball recipe, but come on this is DEB’s recipe, I HAD to try it. No surprise my family wasn’t let down in any way. It’s different from my norm without all the roasted veggies & pesto, but it’s simplicity made it great and a perfect weeknight recipe. The meatballs (which I increased proportionally with 1.25# beef and 0.5# mild Italian sausage) flavored the sauce all the way through. And now with meatballs & sauce that can happen quickly, my family jumps for joy they can have them more often! Had the foresight to double the recipe the first time I made it. So very glad that I did. Best spaghetti and meatballs ever! I was wondering if you could make any part of this ahead. I want to make it on a weeknight for guests but not be stressed! Thank you! I’d form the meatballs and start the sauce if you don’t want any last-minute work. Put them on the tray you’ll bake them. I made the meatball mixture the day before and it worked great. I think it’s actually easier to handle when chilled for a while. The remainder of the recipe was really quick, and I forgot to mention in my own review I did it in one pot (no skillet)–7 quart Le Creuset dutch oven–boiled the pasta, made the sauce, and combined it all in that pot. Was wondering about the 2 eggs. I remember that years ago, Alton Brown proclaimed that for meatloaf and meatballs, use 1 egg per pound of meat. I’ve always stuck to that rule with no issues. I’m thinking that an additional egg might make the mixture too loose/soft to form solid balls. these meatballs were delicious! I made them exactly as written. not only were they tasty, the cleanup was so simple because they were baked. These meatballs are amazing! So easy and delicious. I don’t often cook meat at home but these are worth it. I made the mix the night before–since it was ice cold before making mine took about 5+ minutes longer than prescribed. Used half and half as my milk and they were SUPER rich, so there wasn’t any fighting over them, because two or three go a long way in one serving. As far as the recipe as a whole, I found it a little sparse on the sauce–added about half a 40 oz. jar of Rao’s marinara that I had in the fridge and needed to use up, and still found it to be just enough sauce. Can’t wait to test out the leftovers on my two-year-old tomorrow–his tastes are, um, eclectic, but I *think* he’s going to gobble the meatballs. Perfect , welllll errr no, but darn tasty! So much better then most bottled sauces and most people’s sauce, (non Italian, I hold Paisons to a higher level of judgement). You are Jewish , so consider your mom’s Matso ball soup, hers has been honed to your taste buds for sooo many years. No one can make them like her, or maybe you prefer your Great Granma’s way. In restaurants meatballs are baked, in homes they are fried, except for a few of us. !00% of the dripppings and maybe a deglace with red wine is done as well. After the sauce is fully cooked with meatballs, chunks of pork, pork sausage (with seeds) and hot pork sausage, (with seeds), chunks of beef or veal, then we scooma (skim) all the fat. I paper towel the top, (trick for stock I used , best for aspic). Then bring to a boil, skim again. Our sauce is always a “meat sauce” as in religious dogma. If you dropped in a sliver of any dead mammal, it is now unfit for a meatless meal. You burn in eternal boil pools of oil and lava if you eat it on a “Fish Day” during lent. salt…..I have put salt in sauce 3 times in 40 years. Only in non meat sauces, and then very little. Good tomatoes have 2-3 ingrediants, tomato, heavy puree and Salt, NACL. Also I do not know anyone outside a resataurant who put pasta al dente in a pot with water and sauce and cooks it more. But, while I am a real Americanna as G-Grandma called me, I cook Italian, as do my inlaws and wife. Pizza sauce is seldom cooked, it is ground tomatoes with spices, but left over cooked sauce like this one makes great pizza, (please make it a “2 canner”), on Italian breaded fried bonelass chix cutlets or pork , fried or baked topped with this is an experience. I cannot stress enough how good a “grandma pizza ” this will make bread dough, (of course homemade), sauce sprinkle of Pecorino (no to cow cheese) basil leaf, sprinkle of oregano, oven time. I heard you on WNYC and was looking for the recipes I heard you speak on, today! Made this tonight and it was absolutely fantastic! Doubled the meatball/sauce for a crowd and everyone loved it. Thank you!!! These are delicious and very easy to make!